What do you think it would have been like to be one of the individuals in this picture? 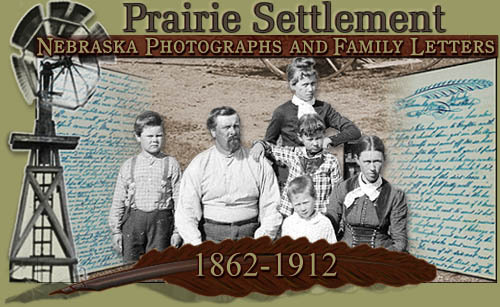 These people all lived on the Nebraska prairie between 1862 and 1912. As you can imagine, life was very different over 100 years ago. How could you learn what it was really like during that time? When you click on the web site right below the picture, you will be able to read letters and see pictures that will help you answer questions about one particular Nebraska family named the Oblingers. Why do you think the Uriah W. Oblinger family settled in Nebraska? What were some of the challenges facing the early settlers of Nebraska? How did geography and climate of the Great Plains affect housing and agriculture? Specific letters and pictures will give the student insight into the life of Uriah Oblinger and his family. In addition, one can find documentation of the hardships they faced while attempting to settle and farm the Nebraska prairie. The purpose of this web inquiry project is to challenge students to not only learn about early prairie life in Nebraska, but to experience it. This Library of Congress digital resource will allow students to imagine they are fellow homesteaders of the Oblinger family. As they analyze pictures, read letters, and view land deeds, they will know firsthand what life was like between 1862 and 1912. How much land could settlers get because of the Homestead Act? How did they make a living? What did they do if they got sick? How many children did the Oblingers have? Where did they get their food? Where did they get supplies to build their homes? Since the letters and documents being investigated were created in the late 1800's and early 1900's, it is possible that terms encountered may have to be defined during the activity. Because these are casual letters between family and friends, slang, shorthanded words, and parts of words are often used. Students should be encouraged to record words in a journal, looking up definitions for some, and being aware that some will have to be determined by context since they may no longer be in modern standard dictionaries. Students will use the Internet for investigation, and should be able to stay on the primary digital resource in the hook for the duration of the project. Table: In the early stages, students can keep track of their information in a three-column table which addresses the three main areas of investigation. Timeline: A timeline would also be helpful, since the letters span the years of 1862 to 1912 and cover the weather conditions at different times of the year, as well as crop and health conditions over time. The members of the family also change over time. Concept Map: As students branch off from the three starter questions with their own questions, they will have a wealth of information to make sense of. At that point, it would be helpful for them to begin an Inspiration concept map which they can add to until completion of the project. As students begin, they will keep their table and perhaps their timeline in a folder or journal. Decide how you want to share out at the end of each day. Students tables should grow significantly after the first day of investigation. On day two, you may want to model concept maps. Even if they do not have access to Inspiration early on, they can record their bubble clusters in their journals, "growing" their map as they find new areas of investigation. The Library of Congress, American Memory Historical Collection, Prairie Settlement digital resource at http://memory.loc.gov/ammem/award98/nbhihtml/pshome.html will act as the primary source, and will be more than sufficient. Students will get the opportunity to perform historical inquiry using a variety of authentic documents located at this site. The "Prairie Settlement" icon will take students to four options: "search by key word," browse by "subjects," "correspondents," or "letters by date." Clicking on "correspondents" will bring them to a list of letters mailed from the Oblinger family to their friends and family. Letters there talked about weather conditions, crops that were grown, and market prices. "Letters by date" helps students check weather conditions and crop conditions by the season of the year. Some students may select to supplement their data analysis with a time line at this point. "Search by subject" allows students to pick any topic for investigation. Clicking on "grasshoppers," for instance, will take students to several letters and pictures showing grasshopper infestation and the resulting hardships. "About the letters" gives students an overview of Uriah's marriages, death of a wife and son in childbirth, and eventual resettlement. Once the students have viewed the historical documents by performing a search by date, correspondence or topic; they will be able to add information to their table and concept map. Click here or on the map below to see an example of a final concept map (larger version of the map below). To view the actual sources of information you may click on the hyperlinks contained within the example final concept map. Concept Map: Every group will be expected to elaborate upon their initial concept maps answering as many questions as possible and exploring answers to new questions provoked by the investigation process. The final concept map could include all areas the students investigated and may look something like the final concept map included in the Analysis section. Timeline: In addition, students may want to put together time lines, especially for weather conditions and hardships that may correspond to specific times of year. Diary with RAFTS: Students can be a member of the Oblinger family during this process and keep a diary of the experience. RAFTS encourage students to take on a Role, address a particular Audience, write in the Format of a diary, and write on the Topic of living as a settler from 1862 through 1912. Here are some sample follow up questions students might have and wish to investigate at a later time. Did children go to school? If so, where? What was a teenager's day like? What type of transportation was used in these times?